Start Your Search on the Library homepage includes nearly all of our eBooks and is probably the best place to start your search. OskiCat, the UC Berkeley catalog, can be a good place to verify whether or not a specific title is available in an online format at Berkeley. Browse our full list of eBook databases. If you want to search for eBooks in a specific discipline, or those published in a particular time period or place, you might want to search a specific eBook database directly. Campus-affiliated users and members of the public on library public-access computers can often download some version or portion of library-licensed eBooks, but access varies by platform*. Those users can almost always read the entire book online, and can often download single chapters or a limited number of pages. Sometimes users can download an entire book without restrictions, and other times you can "check out" the eBook for a limited period of time (though the latter may be limited to campus-affiliated users). Many eBook platforms offer PDF downloads, and others require the use of free eBook viewing/reading software. * Off-campus access to library-licensed eBooks, like other online library resources, is not available to members of the public. More information on who is eligible to use the proxy server. In the Start Your Search search results, select eBooks from the Source Types filter in the column to the left of the page. 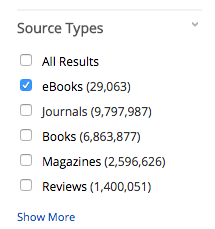 If you don't see a listing for eBooks under Source Types, choose the Show More link and look for eBooks there. Note that Download (Offline) links require you to create and login to a My EBSCOHost account. From OskiCat's Quick Search, change the dropdown to the right of the search box from "Entire Collection" to "Available Online" and enter your search terms. To access an eBook from the OskiCat search results, first select the link to a particular title. Access the eBook via the link in the Link to online version(s) box. NOTE: The link will include the name of the database, not the eBook title, and often includes a notice such as "Restricted to UC campuses." This guide includes an excellent list of resources for finding digitized books available online for free, regardless of institutional affiliation. Look for open and licensed eTextbooks. This guide was adapted from Cornell University Library's Ebooks at Cornell guide.